There’s so many bumblebees around but they move so quick, I’m often complaining about not getting a good picture of them. Then I saw this one, just sitting around on some flopped-over daffodil leaves. Cool! I thought. I hope it doesn’t fly away when I get close. And it just sat there. Very not like a bumblebee. Weird, I thought, I hope it’s okay. And then I saw the picture. Those antennae! Those eyes! Those legs! No way is that a bumblebee! It had to be a bee mimic, like the drone flies I’ve seen from time to time. These are syrphid flies that live in murky water as larvae, and emerge as flies looking amazingly like bees. Some look only vaguely beelike. Some look just like honeybees. Some look just like various kinds of bumblebees. Bugguide says this one is Mallota posticata which means something like “woolly bee mimic fly with really big back legs”. 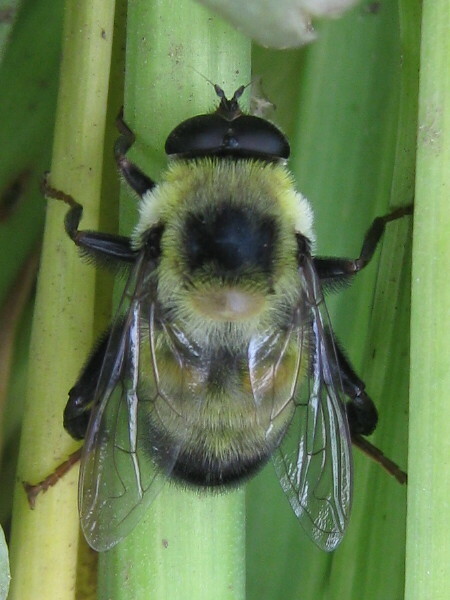 Or maybe it means “husky syrphid fly wearing a bumblebee suit.” Or maybe it means there’s so many bumblebees around, even the flies want to be bumbles. There’s so many bumblebees around, even the flies want to be bumbles. Now that’s serendipity. Neat that you got the photo, albeit under false pretenses! I had not known about these particular mimics. Yes, isn’t it freaky looking? Honeybee mimics are amazing enough, but when I looked up the bumblebee mimic, in bugguide, I discovered several a couple of genera worth of them. There’s a lot of these guys around!